Richards, Jack C. and Rodgers, Theodore S. 1987. Through the Looking Glass: Trends and Directions in Language Teaching. RELC Journal, Vol. 18, Issue. 2, p. 45. Pennycuick, D.B. and Murphy, R.J.L. 1986. Mastery, validity and comparability issues in relation to graded assessment schemes. Studies in Educational Evaluation, Vol. 12, Issue. 3, p. 305. Pennycuick, D.B. and Murphy, R.J.L. 1986. The impact of the graded test movement on classroom teaching and learning. Studies in Educational Evaluation, Vol. 12, Issue. 3, p. 275. Edmondson, Willis 1985. Language purpose and language use. Journal of Pragmatics, Vol. 9, Issue. 2-3, p. 397. Brindley, Geoff 1985. Some current issues in second language teaching. Australian Review of Applied Linguistics, Vol. 8, Issue. 2, p. 87. Quinn, T. J. 1984. Functional Approaches in Language Pedagogy. Annual Review of Applied Linguistics, Vol. 5, Issue. , p. 59. Abbreviations: AVLJ = Audio- Visual Language Journal; BJLT = British Journal of Language Teaching; ML = Modern Languages; MLS = Modern Languages in Scotland; TES = Times Educational Supplement. Alexander, L.G. (1979). A functional/notional approach to course design. AVLJ, 17, 2, 109–14. Anon. (1978). Report from the York Area Working Party on language proficiency tests. ML, 59, 3, 150–2. Arrowsmith, R. (1980). An exercise in DIY. The Clwyd course in French. TES, 8.2.80. Bergentoft, R. (1980). Intensive visit organised by the British authorities within the framework of the interaction network in the schools sector of the Modern Languages Project (document CC-GP4) 80 (16). Strasbourg: Council of Europe. Biggs, B. C. (1980). A graded system of examinations in modern languages. The teaching of modern languages: a view for the 1980s. Headmasters' Conference Report 2, 39–41. Bird, E. (1982). Graded objectives, where now? The Teaching of Modern Languages, Perspectives 10, 61–77. Exeter: School of Education, University of Exeter. Blight, M. (1982). The place of grammar. In Hodgson, G. A. (ed), 37–8. Bolton, D. R. (1980). York area graded language proficiency tests. MLS, 19, 88–97. Brown, E. (1982). Goethe Institute GOML Workshop: Report of the Third Workshop on Graded Objectives, Testing and examinations at secondary level. GOML Newsletter 7, 7–8. Buckby, M. (1973). A syllabus for modern languages at 16+. AVLJ, 11, 1, p. 62. Buckby, M. (1976). Language deprivation. TES, 29.10.76. Buckby, M. (1977). Modular approach. TES, 15.4.77. Buckby, M. (1978). Report from the York Area Working Party on language proficiency tests. ML, 59, 3,150–3. Buckby, M. (1980 a). A graded system of syllabuses and examinations. MLS, 20, 75–81. Buckby, M. (1980 b). Action! London: Nelson. Buckby, M., Bull, P., Fletcher, R., Green, P., Page, B. & Roger, D. (1981 a). Graded objectives and tests for modern languages: an evaluation. London: Schools Council. Buckby, M. (1981 b). Graded objectives and tests for modern languages: an evaluation. BJLT, 19, 1, 13–14. Buckby, M. (1981 c). Better to have had and lost. TES, 6.2.81. Byram, M. S. (1978). ‘New objectives’ in language teaching.ML, 59, 4, p. 205. Byram, M. S. (1979). Performance objectives and language learning. ML, 40, 2, 111–15. Campbell, J. A. (1980). Objectives testing in modern languages. MLS, 20, 100–12. Chapman, D. (1980). Graded levels of achievement in foreign-language learning. MLS, 19, 62–75. Clark, J. (1977). Certification – sway forward? MLS, 13, 89–93. Clark, J. (1978). Lothian region's levels of achievement scheme. MLS, 15, 158–60. Clark, J. (1979 a). The syllabus. What should the learner learn? AVLJ, 17, 2, 99–108. Clark, J. (1979 b). Syllabus design for graded levels of achievement in foreign-language learning. MLS, 18, 25–39. Clark, J. (1980 a). Lothian region's project on graded levels of achievement in foreign-language learning: from principles to practice. MLS, 19, 61–74. Clark, J. (1980 b). Communication in the classroom. MLS, 21/22, 144–56. Clark, J. (1981). Some caveats about current curriculum development in modern languages involving the objectives model, defined syllabuses and criterion referenced assessment. NALA (Journal of the National Association of Language Advisers), 12, 6–8. Clark, J. (1982). Syllabus design for foreign-language learning at various levels. In Hodgson, G. A. (ed. ), 16–28. Clarke, J. (1979). Graded tests in schools. AVLJ, 17, 2, 123–4. Clarke, J. (ed.) (1980). Graded French tests. London: Nelson. Cockroft, W. (1983). Interview with editor. Schools Council News, 42, 6–7. Coste, D., Courtillon, J.Ferenczi, V., Martins-Baltar, M. & Papo, E. (1976). Un niveau-seuil. Strasbourg: Council of Europe. Cross, D. (1979). Motivating the majority. AVLJ, 17, 2, 83–6. Davidson, J. M. C. (1973). A common system of examination at 16+: some reactions to the Schools Council Bulletin No. 23. ML, 54, 1, 14–22. Department of Education and Science (1983 a). A survey of the use of graded tests of defined objectives and their effect on the teaching and learning of modern languages in the county of Oxfordshire. Department of Eduction and Science (1983b). Foreign languages in the school curriculum. Downes, P. J. (1978). Graded examinations for elementary language learners: the Oxfordshire project. ML, 59, 3, 153–6. Downes, P. J. (1980). Graded examinations for elementary language learners: the Oxfordshire project, The teaching of modern languages: a view for the 1980s. Headmasters' Conference Report 2, 36- 9. Dunning, R. (forthcoming). The East Midlands graded assessment feasibility study. Paper given at the Annual Meeting, BAAL, 1982. Ellis, D. (1978). Modern languages credit system. NALA (Journal of the National Association of Language Advisers). Friedman, E. S. (1981). EMREB CSE Research Project: third annual report. School of Education, University of Leicester. Friedman, E. S. (forthcoming). Evaluation of the East Midlands graded assessment feasibility study. Paper given at the Annual Meeting, BAAL, 1982. Friedman, E. S. (1982). Evaluation of the East Midlands graded assessment feasibility study for the year 1979–80. School of Education, University of Leicester. Friedman, E. S. (1983). Evaluation of the graded assessment feasiblity study. In EMREB CSE Research Project: 4th Annual Report, 3–6. Garner, E. (1981 a). Going for G.O.A.L.S. TES, 6.2.81. Garner, E. (1981 b). Background studies and graded examinations. NALA (Journal of the National Association of Language Advisers), 12, 9–10. Garside, T. (1982). What graded objectives has meant to us. GOML Newsletter No. 6, 9–11. Gia, A. C. (1982). The GLAFFL project. ATI Journal (Association of Teachers of Italian), 35, 63–7. GOML Committee (1982). The GOML Committee's response to the 16+ national criteria. GOML Newsletter No. 6. Gordon, K. L. (1977). The first formal account. TES, 4.11.77. Gordon, K. L. (1980). Oxfordshire Modern Languages Achievement Certificate. MLS, 19, 99–114. Grundy, J. (1983). Teaching for OMLAC across the ability range. OMLAC News Sheet No. 1. Oxfordshire Education Authority. Harding, A. & Page, B. (1974). An alternative model for modern language examinations. AVLJ, 12, 3, 237–41. Harding, A. (1978). La gradation des objectifs d'apprentissage des langues vivantes dans le Royaume-Uni. In Coste, D. (ed. ), Contributions à une renovation de l'apprentissage et de l'enseignement des langues (1982). Strasbourg: Council of Europe. Harding, A. & Naylor, J. A. (1979). Graded objectives in second-language learning: a way ahead. AVLJ, 17, 3, 169–74. Harding, A., Page, B. & Rowell, S. (1980). Graded objectives in modern languages. London: CILT. Harrison, A. (1982). Schools Council Examinations Bulletin 41: review of graded tests. Methuen Educational. Hodgson, G. A. (ed.) (1982). Tongues, 26, Special issue: Graded Objectives. Curriculum Directorate, Education Department of South Australia. House of Commons. Report of the Education, Science and Arts Committee, Session 1981–1982. The secondary school curriculum and examinations, 1, lvi. ILEA (1980). Éclair. Mary Glasgow Publications. ILEA (1980 onwards). Éclair. Graded Tests Levels 1–3. Mary Glasgow Publications. Johnson, D. (1980). ILEA Graded Tests Working Party, a progress report. MLS, 19, 115–21. Lees, N. (1983). Observing classroom procedures and standardising assessment in the graded assessment of French. EMREB CSE Research Project: 4th Annual Report, 22–7. Lees, N. (forthcoming). Aspects of standardisation within a communicative assessment syllabus. Paper given at the Annual Meeting, BAAL, 1982. McGhee, B. (1982). Graded objectives (EMREB) NALA (Journal of the National Association of Language Advisers), 13, 30–1. McLean, D. (1982). The implementation of graded objectives syllabus in teaching modern languages. In Hodgson, G. A. (ed), 29–33. McLeod, S. (1982). What's happening in the North West (Cumbria–Lancashire)? GOML Newsletter No.6, 11–13. Modern Language Association (1981). Submission by the MLA to the Parliamentary Select Committee on Education, Science and the Arts in connection with an enquiry into the secondary school curriculum and examinations: 02 1981. ML, 52, 2, 102–9. Modern Languages Curriculum Committee (1982 a). The development of graded objectives. In Hodgson, G. A. (ed. ), 1–2. Modern Languages Curriculum Committee (1982 b). An introduction to the graded objectives approach to language teaching. In Hodgson, G. A. (ed. ), 3–15. Morrow, K. (1977). Techniques of evaluation for a notional syllabus. London: Royal Society of Arts. Neumann, R. (1982). The use of graded objectives in German in the classroom. In Hodgson, G. A. (ed), 34–6. OMLAC (1977). New objectives in modern language teaching. London: Hodder & Stoughton. OMLAC (1981). New objectives in modern language teaching, Book 2. London: Hodder & Stoughton. Otter, H. S. (1968). A functional language examination. Oxford: Oxford University Press. Page, B. (1973). Another look at examinations. AVLJ, 11, 2, 127–30. Page, B. (1974). An alternative to 16+. ML, 55, 1–5. Page, B. (1975). Shorter courses and more motivation needed. TES, 31.10.75. Page, B. (1978). Graded examinations. ML, 59, 2, 97–101. Page, B. (1979). Notions, functions and threshold levels: a review of the significance for language teachers of the work of the Council of Europe. AVLJ, 17, 2, 115–22. Page, B. (1981 a). Graded objectives in modern language teaching and learning in the United Kingdom. Aspects of Education (Journal of the Institute of Education. The University of Hull), 25, 27–34. Special issue (ed. Richardson, G.), Modern language teaching in the 1980s. Page, B. (1981 b). Graded objectives. In Design, Evaluation and Testing in English Language Projects, Dunford House Seminar 1981. London: British Council. Page, B. (forthcoming, a). Defined syllabuses: crutch or straitjacket? Paper given at the Annual Meeting, BAAL, 1982. Page, B. (forthcoming, b). 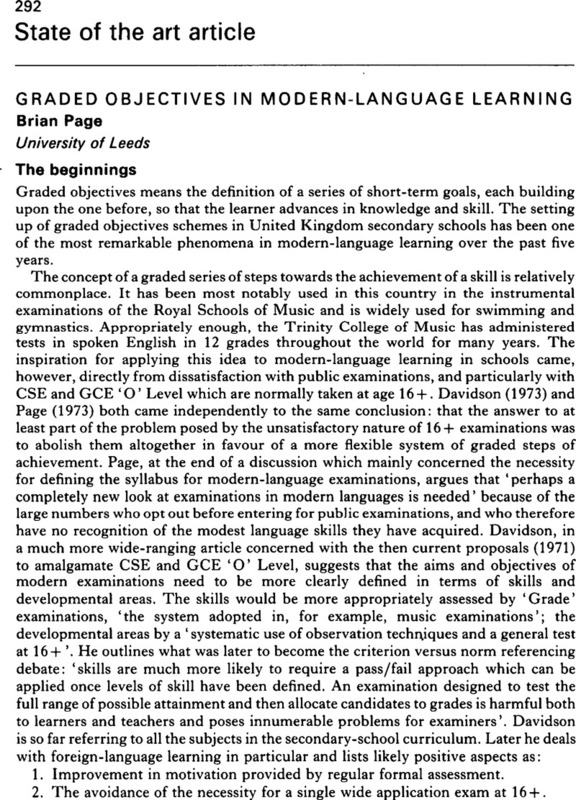 Development of graded objectives systems in modern language learning in the United Kingdom. NIMLA (Journal of the Modern Languages Association of Northern Ireland). Paul, R. H. (1981). Needed: stepladders of foreign language learning. Foreign Language Annals, 14, 5. Peck, A. (1980). The York Schools German Achievement Test. Treffpunkt, 12, 1, 17–21. Porcher, L., Huart, M. & Mariet, F. (1979). Adaptation de ‘Un niveau-seuil’ pour des contextes scolaires. Strasbourg: Council of Europe. Richterich, R. & Chancerel, , Jean-Louis, (1977). Identifying the needs of adults learning a foreign language. Strasbourg: Council of Europe. Reprinted by Pergamon Press, 1980. Rowell, S. (1980). Oral testing: report of a meeting with reports of contributions from ILEA (J. Farrell), OMLAC (P. Dickson), Lothian (J. Hamilton), East Midlands (R. Dunning), Archbishop Michael Ramsey School (David), Yorkshire Regional Examinations Board (Brian Park). Further reports from the Working Parties on the content, conduct, marking of oral tests. GOML Newsletter No. 3. Rowell, S. (ed.) (1981 a). Report of a meeting to discuss possible common elements in a Level 4 (CSE Mode 3) examination. GOML Newsletter No. 4. Rowell, S. (ed.) (1981 b). Grading GOML Levels 3, 4, 5 and 6. Reports of Working Parties. GOML Newsletter No. 5. Rowell, S. (1982). The communicative classroom: report of working meeting. GOML Newsletter No. 7. Sheils, J. (1982). Graded objectives. Teangeolas, 14. Tracy, C. (1982). Graded objectives in modern languages: a personal view. NIMLA (Journal of the Modern Languages Association of Northern Ireland), 9, 25–32. Trim, J. L. M., Richterich, R., Van, Ek J. A. & Wilkins, D. A. (1973). Systems development in adult language learning. Strasbourg: Council of Europe, Reprinted by Pergamon Press, 1980. Trim, J. L. M. (1977). A European unit credit system. MLS, 14, 39–44. Trim, J. L. M. (1978). Developing a unit/credit scheme of adult language learning. Strasbourg: Council of Europe. Reprinted by Pergamon Press, 1980. Trim, J. L. M. (1979). Explicit objectives. TES, 16.11.79. Trim, J. L. M. (1980). Council of Europe: Council for Cultural Cooperation Project No. 4: Modern Languages. MLS, 19, 51–4. Utley, D., Mitchell, R. & Phillips, J. A. N. (forthcoming). Graded objectives in modern languages: oral/aural investigation. London: Schools Council. Van, Ek J. A. (1975). Threshold Level English. Strasbourg: Council of Europe. Reprinted by Pergamon Press, 1980. Van, Ek J. A. (1976). The Threshold Level for modern language learning in schools. London: Longman. Van, Ek J. A., Alexander, L. & Fitzpatrick, M. (1977). Waystage English. Strasbourg: Council of Europe. Reprinted by Pergamon Press, 1980. Van, Ek J. A. (1977). The Threshold Level, MLS, 14, 44–50. Watts, N. & Brooker, G.A defined language syllabus within a communicative approach: reflections on the new French and German syllabuses. New Zealand Language Teacher, 7, 3. Whalley, M. & Whiteside, S. (1980). Graded tests in French and German. Essex Education, 34, 2, 37–8. Wilson, J. (1982). Graded levels of achievement – millenarianism revisited? What can we do while we wait? In Hodgson, G. A. (ed), 39–42. Wood, N. (1982). Graded tests for London. TES, 5.11.82.